Uefa has threatened to disqualify England and Russia from Euro 2016 if there is any further violence by fans. It has begun disciplinary proceedings against Russia - but not England - after "totally unacceptable" scenes at Saturday's England-Russia game. Footage appeared to show Russia fans rush at England supporters after the Euro 2016 1-1 draw in Marseille. Charges against Russia are for crowd disturbances, racist behaviour, and setting off fireworks, Uefa confirmed. There were issues with segregation of fans, the body admitted, promising security would be "strengthened". The UK government said it had offered to send extra British police to France ahead of England's next match in Lens on Thursday. Witnesses said trouble began in the stadium after flares were let off by Russian fans near the end of the game. Some then climbed across barriers designed to keep rival fans apart. Who do Europe's papers blame? A number of Russia supporters appeared to kick and punch fleeing England fans, who were forced to clamber over fencing to escape. Earlier in the day, England, Russia and local fans were embroiled in ugly clashes with riot police, with a number of bloodied fans being taken to hospital. In a strongly-worded statement, European football's governing body said it would not hesitate to impose sanctions on either Russia or England should such violence occur again. Measures included the potential disqualification of their respective teams from the tournament, it said. Earlier Russia's sports minister Vitaly Mutko said Uefa had "done the right thing" to start a disciplinary case against the Russian Football Union, R-Sport news agency reported. "There were flares, there was a flare gun, there had been clashes in the stands, it's necessary to sort all of this out," he reportedly said. "The fans were rooting greatly, but there are people who do not come for the football." Also on Sunday, French Interior Minister Bernard Cazeneuve said alcohol restrictions near "sensitive" venues would be extended, with sales bans on match days and the eve of match days. England spectators who were at the match have described a "desperate scramble" to escape charging Russia fans, some of who were wearing gum shields and MMA (mixed martial arts) gloves, one witness claimed. Cory McLeod, who was in the stadium, told the BBC: "A wall of Russian fans charged at our section, which had kids, women, and even some Russian fans in. "I couldn't see if any of them had weapons or anything but people were running fast, it was manic, just a desperate scramble towards a large fence in the corner." Others spoke of "slack" security. Sam Blackwell, from Kingston upon Thames, south-west London, said the only entry search was "a quick pat down". "This would go a long way to explaining how the Russian fans got flares, fireworks and whatever the big bang was into the ground." Six British nationals remain in hospital and several more have received treatment, the UK government said. FA chief executive Martin Glenn said a letter from Uefa about fans' behaviour, was being treated with the "utmost seriousness". "We understand the potential implications of our supporters' actions and wholly accept that every effort needs to be made by the FA to positively urge them to act in a responsible and respectful way," he said in a statement. "Violent scenes like those witnessed over the weekend in Marseille have no place in football, nor society as a whole." Sanctions against Russia will be decided at a disciplinary meeting on Tuesday, Uefa said. BBC sports editor Dan Roan said as hosts of the 2018 World Cup, Russia was under intense scrutiny. Uefa's decision would also come under scrutiny, he said, with Russia's next match against Slovakia taking place in Lille on Wednesday - the day before England's match against Wales just 24 miles away in Lens. From the moment England and Russia fans started flooding into Marseille, there was an undercurrent of tension and violence that was transformed into scenes that were a throwback to some of football's worst hooligan excesses of the past. In the steamy, humid environment of this port city, with alcohol flowing freely, all the ingredients were in place for events that unfolded in the Vieux-Port de Marseille. As a long, hot Saturday wore on towards a late kick-off, the scenery shifted to the magnificent, sweeping curves of the Stade Velodrome, culminating in the disgraceful incidents that took place just seconds after full-time. It was particularly disturbing given the high levels of security and policing that were in evidence around the stadium as the authorities remain on high alert after November's Paris attacks. Security, here at least, seemed in very short supply. It was the sort of hooliganism the game's rulers hoped had been stamped out but has reared its head in sinister fashion less than 48 hours into Euro 2016. Russia were previously punished for the behaviour of their fans inside stadiums at all three of their group games during Euro 2012 in Poland and Ukraine. Its football union was fined a total of £150,000 and given a suspended six-point deduction from its qualifying campaign for Euro 2016. This was reduced on appeal. Uefa said it had not taken any action against the English FA, as skirmishes involving England fans before kick-off fell outside its remit. Police in riot gear clashed with England fans in Marseille's Old Port area and used tear gas for a third day on Saturday, as well as water cannon, as fist fights and bottle throwing broke out. Wife of England and Leicester City striker Jamie Vardy, Rebekah, tweeted that she was among bystanders gassed and "caged" by French officials outside the stadium. As many as 20 England fans were injured, with a number taken to hospital, and at least one Briton is understood to be in a critical condition. 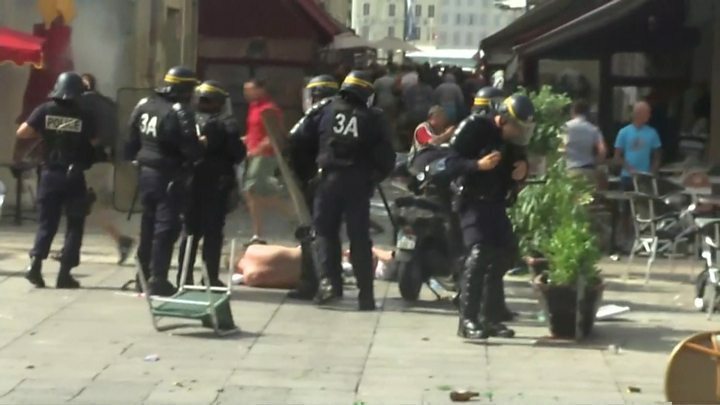 There were also clashes in the city of Nice between police and fans from Northern Ireland and Poland, who are due to play their opening match later on Sunday. Six people were reportedly injured, before order was restored. The UK government condemned the violence and urged calm on all sides. It said it had offered to send police, including "spotters" to sit in the crowd at the next match, to support the security operation, and British officers would be assisting the French with their post-incident investigations. It has also enhanced its Border Force presence at outbound ports. Marseille's Stade Velodrome next hosts a match on Wednesday, when France play Albania.